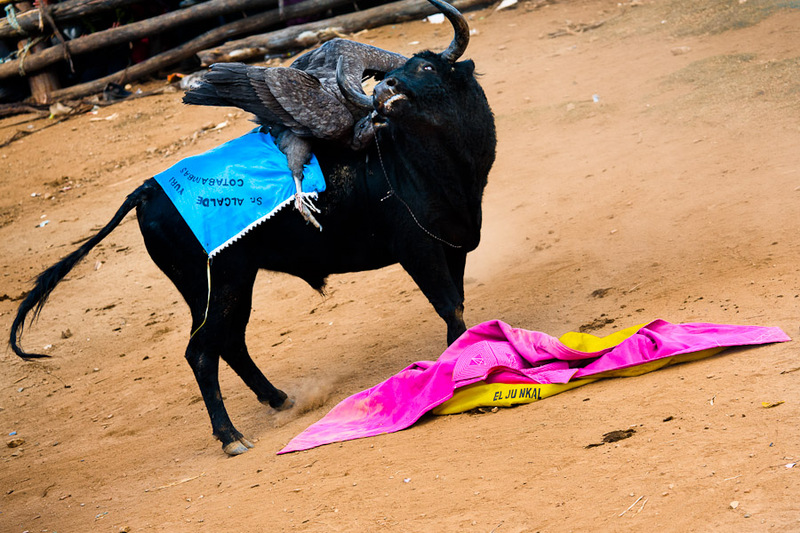 Is A Condor Forced To Fight A Bull Graphic? The New York Times says no. Well, we are used to seeing cruelty being inflicted by humans on other species in the name of culture. But at least a NYT story and video featuring a Peruvian ritual that involves tying a condor to a bull was objectionable enough to be examined by the NYT Public Editor, Margaret Sullivan. The video, intended to explain an important cultural practice in Peru, amounts to depicting animal abuse, wrote Amanda Schinke, a PETA spokeswoman. Although we appreciate that the story touched briefly on conservationists’ opposition to this practice, we were surprised that it did not address the cruelty inherent in strapping a wild bird to a terrified bull and instead presented this cruel practice as a venerable tradition. It creates the impression that The Times endorses cruelty or insensitivity to animals. Would you please add a disclaimer that the story – especially the photo and video elements – depicts graphic cruelty to animals? The Times, which is rapidly increasing its production of videos, brings the same standards to those videos that it does to its other journalism. Does this video meet those standards? And is a disclaimer necessary here? I asked Richard L. Berke, a senior editor who is directing video development, to respond. He noted that The Times often does use a disclaimer to alert viewers to disturbing or graphic content. Images of war and disaster, as in this video, which does include a disclaimer, are the most common examples. In this case, however, “the video didn’t merit a disclaimer,” Mr. Berke said. What’s interesting is that Berke seems to feel that the amount of blood or ripped flesh is what determines whether the images are graphic, rather than the entire concept of strapping a condor to a bull and then watching them try to rip into each other. Would Berke consider a video of a pit bull ripping into a human which doesn’t show much injury or blood “graphic”? I would bet yes, because it is a human that is being harmed. In any case, Sullivan agreed with Berke. Which goes to show that while human violence and cruelty involving other humans is considered “graphic” enough to warrant a warning, human cruelty to animals is still not objectionable enough to get the same treatment. Which is a telling insight into how we continue to view (nonhuman) animals and the human treatment of animals.